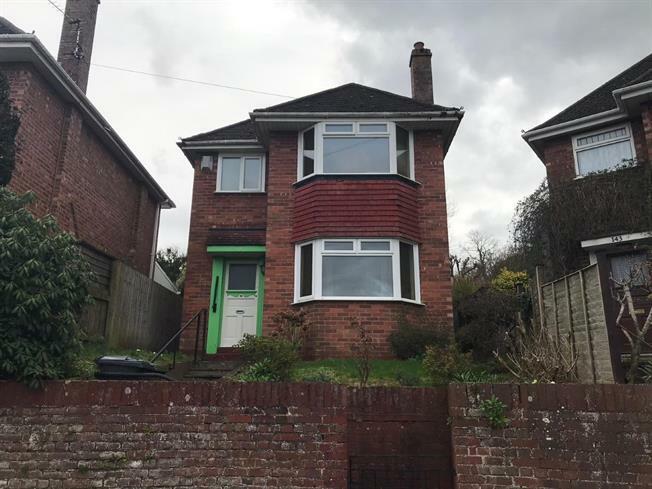 2 Bedroom Detached House For Sale in Exeter for Offers in excess of £230,000. An early viewing is highly recommended to make the most of this family home. Accommodation to the ground floor comprises lounge, dining room and kitchen. To the first floor you will find two bedrooms which are both generous in size as well as a family bathroom. The property is partially double glazed with night storage heating. To the rear of the property you will find a good sized garden where ground works have already been instigated in preparation for extension. UPVC double glazed bay window to the front aspect. Carpeted flooring, fireplace. TV aerial point. Radiator. Aluminium double glazed sliding doors to the rear providing direct access to the garden. Carpeted flooring, fireplace, radiator. A range of matching wall and base units with a roll top work surface. Freestanding electric oven, space for fridge and freezer. Space and plumbing for washing machine. Stainless steel sink with drainer and mixer tap over. Wooden window to the side aspect. Vinyl flooring, wall mounted boiler. UPVC double glazed door providing direct access to the garden. UPVC double glazed bay window to the front aspect providing fantastic views across the city of Exeter. Carpeted flooring, electric fire. UPVC double glazed window to the rear aspect over looking the garden. Carpeted flooring, electric fire. A three piece suite comprising low level WC pedestal hand wash basin and bath with shower over. UPVC obscure double glazed window to the rear aspect. Tiled surround, vinyl flooring. To the rear of the property you will find a fully enclosed garden which is mainly laid to lawn and also provides a storage shed. This is the perfect area for alfresco dining during the summer months. Ground works have already been instigated in preparation for an extension. Subject to obtaining the relevant planning permissions being obtained there would be potential to create a one or two storey extension.